This book is an Amazon e-book (special format for Kindle book) about complete guide to create model of boat or ship that could sail without burning fuel, no electricity, and no wind blow. The book is also available in Google books. 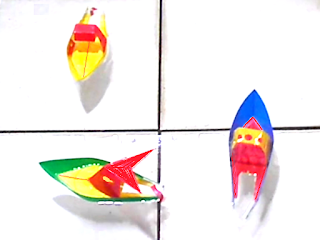 See below video about 3 colorful origami boat sail together, and a fast boat sails in a long water gutter. Read also about educational submarines toy which can move forward, dive and resurface, like the real one: baking powder submarine and also electric submarine. More info about ship and submarine science toys which can move like the real ones, can be read in label boat . Below video shows that boat is very simple, no complicated moving parts inside. It is very easy to made using household materials and can be performed by a 10-year-old child. Watch a video about 3 origami soap boats sail closely in circle. But the basic principles to support the boat performance is state of the art technology. Therefore, the book can be a good education for children or adults who want to learn about the boat and ship technology. Some boat designs are tested to find the best performance. This way the reader can analyze, compare, find, and create their own designs, which hopefully would be better. Video below shows how fast this soap boat can sail with relatively heavy origami body. The boat is using soap as 'fuel'. Some soaps, shampoos, shower gels, detergents have been tested. Although some chemicals such as alcohol, acetone, can also be used, but this book focuses only on benign household materials. The boat can be used as promotional gifts for children soap and shampoo products. Because it is very cheap to produce, easy to be packed and transported along with the main product (soaps and shampoos). With plastic paper origami, the boat could be made to have top body to make it looks beautiful like a real boat. Juga tersedia berbagai buku tentang kapal selam baking powder yang dapat menyelam dan naik kembali ke permukaan. Dan juga buku tentang kapal dan kapal selam bertenaga baterai. Keterangan lebih lanjut dapat juga dibaca di artikel-artikel dengan label boat di situs ini.